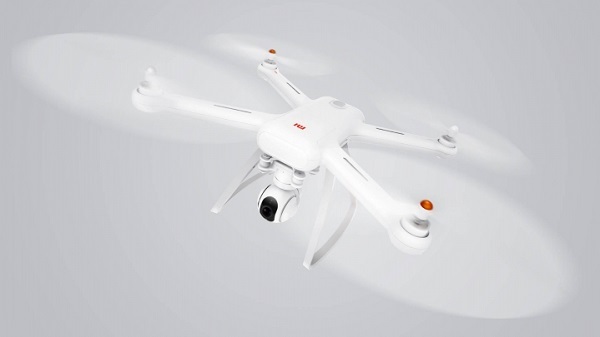 Xiaomi launches Mi Drone, world's first modular consumer drone. Xiaomi today announces the launch of world's first modular consumer drone, the Mi Drone. Mi Drone comes with in variants: 1080p and 4K UHD priced at ￥2499 ($380) and ￥2999 ($456) respectively. Mi Drone uses module design which is easy to disassemble and assemble. You can trace Mi Drone's position via GPS and once the Mi Drone fly out of the connected range then it will automatically fly back to the original position where it took off. It comes with GPS + GLONASS + vision-based positioning for max precision. You can monitor the battery of Mi Drone and whenever the battery is low then there is warning alarming on the phone screen. If the there're restricted areas in your country, Mi Drone will hover automatically at the edge of no-fly zones. Mi Drone uses PCB antenna which amplifies the signal so that you can control the drone up to 2km. Mi Drone has a large 17.4V 5100 mAh battery and it can fly continuously up to 27 minutes. Mi Drone's remote control looks like an ordinary Bluetooth controller but it's not. Taking photos, videos, auto take off/landing, auto hover, point flying, flying router planning flying all are controlled via this controller. Xiaomi's Mi Drone packs 12MP Sony's sensor, Ambarella image processing processor and support 1080p or 4K UHD recording (3840 x 2160) and raw format with 104° wide-angle lens. Mi Drone's camera is attached to a 3-axis gimbal, stabilizes up to 2000 vibrations per second.